eNLokam: Kavery Kalanithi, the highest paid Indian woman!!! Kavery Kalanithi, the highest paid Indian woman!!! Who is the highest paid Indian woman? The first name in your mind may be ICICI Bank chief executive Chanda Kochhar and the like. But she is no where near some other ‘real earning ladies’. Sun TV Network’s joint MD Kavery Kalanithi, the wife Kalanidhi Maran, is the highest earner with an annual salary of $13.09 million. This is equivalent to 64.4 crores! That means a monthly salary of 5. 37 crores!!! Can you imagine such a salary?! 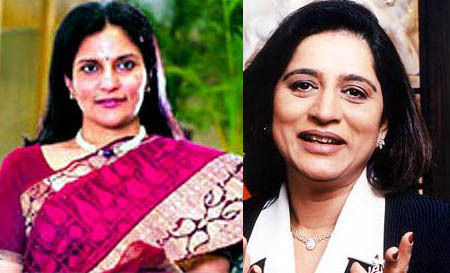 Kochhar does not find a place among the ten highest paid women executives in the country. Strange, isn’t it? Chairperson of the real estate company, Peninsula Land, Urvi A Piramal is at the second place with $ 1.74 million pay (about 8.7 crores). At third place there is Preetha Reddy, hte MD of Appolo Hospitals, with $ 1.11 million (about 5.5 crores) and at fourth there is Vinita Bali, the managing director of Britania Industries with $ 1.03 million (about 5.1 crores).